Amazon’s Kindle (s amzn) iOS (s aapl) application received an update overnight, bringing some useful new features. But what might be more noteworthy is what it didn’t bring, in light of the recent rejection of Sony’s Reader application by Apple, and the introduction just this morning of a new in-app subscription system for iOS. The update introduces real page numbers to Kindle books, a feature which Amazon outed for hardware Kindle users in its pre-release software beta Feb. 8. 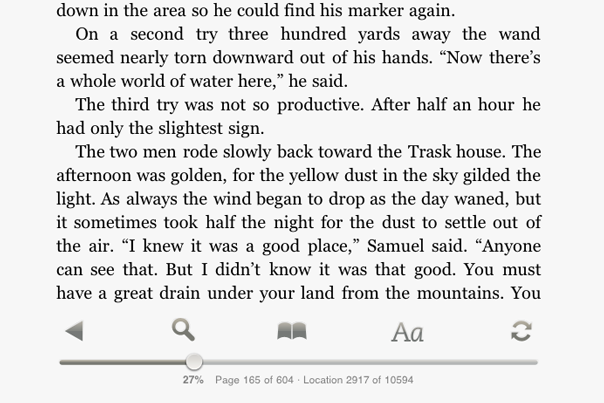 It also brings reading progress bars to your book index page, so you can see at a glance how far you’ve read. You can also now look up words in either Google (s goog) or Wikipedia without leaving the Kindle app. What’s more interesting, at least from the perspective of those concerned with how Apple does business, is that the update doesn’t include any changes in the way Kindle book purchases are handled. The Kindle Store link continues to exist in the upper right-hand corner of the app’s interface, and it continues to kick you out to the Amazon website in mobile Safari. This wouldn’t be cause for comment, had Apple not recently rejected Sony’s Reader (s sne) app on the grounds that it didn’t provide a method for users to buy books in-app, and then made a public statement claiming it would be requiring all e-book sales to offer in-app purchasing going forward. Then, just this morning, Apple announced in-app subscriptions, and made a point of noting that links to outside websites where customers could buy “content or subscriptions” (emphasis added) outside the app. Publishers are free to maintain storefronts on the web, they just can’t link to them. It hard to read that statement in a way that doesn’t refer specifically to how the Kindle app handles its business. Yet, despite all Apple’s crowing regarding its new stance regarding in-app purchases in general, and the sale of e-books in particular, Amazon’s update came through to users without a hitch last night. The Kindle app still lacks support for magazines and periodicals, however, something Amazon said was coming to the platform, and which it recently introduced to the Android version of its mobile software (s goog). Apple may be unwilling to allow the introduction of those features until Amazon complies with its new in-app content policies. Amazon is probably just benefitting from the grace period in place for publishers to comply with the new in-app purchasing system, which states that devs have until Jun. 30 to get their houses in order and submit a build using the in-app API. Other apps like Zinio that were offering content and subscriptions through external sites also haven’t been pulled or shut down, so that explanation seems most likely. If indeed there is a showdown coming between Apple and its major content providing partners, Jun. 30 is the date to watch. Amazon too big to kick out. No kindle is pretty much the same as no e-reader function on your tablet. “Amazon is probably just benefitting from the grace period in place for publishers to comply with the new in-app purchasing system.” – But why didn’t this apply to Sony then? Anyone has any idea what the profit margin is on an ebook for Amazon? I suspect it is below 30%. Even a 50-50 split between Apple and Amazon would require the profit margin to be 60%. That is definitely unrealistic. BN, Sony, Amazon need to team up and ditch Apple collectively!! When Apple created its iBookstore, it negotiated a deal that has become known as the Agency Model with most of the major publishers except Random House. This deal makes the publisher the retailer and all booksellers agents. This let the publisher set and enforce the price. The margin to booksellers like Apple, Amazon and everyone else is set at 30% from these publishers which account for the vast majority of books sold. Under Apple’s new regime, Amazon can sell books for what they cost if you do not include the cost of infrastructure. This is not an attractive business model. Smaller companies like us get most of our books through a wholesaler who gets 10%. Adobe DRM adds 15 cents per book. This means that under Apple’s new deal, we lose $1.15 cents on a $10 book. Apple makes $3.00 for processing the credit card and hiding our customer’s identity from us. Our iFlow Reader is much better than Apple’s iBooks and we had great plans. Our whole strategy was to just keep innovating and be the best ereader. We thought we create create a profitable business against the slow moving Goliaths of the ebook business by being better. As it turns out, this does not work in a totalitarian world when the dictator wants it all. Like all dictators, Apple is getting greedy and we will all pay the price. The price for us is that we have no choice but to go out of business. Today, it’s ebooks, but Apple’s greed will continue. Every developer out there is at risk of being preempted by Apple. The common Fanboy notion that this is all good for consumers is absurd. Monopolies are never good for consumers. * By not allowing in-app purchasing (or apparently even linked-to-Safari buying), Apple makes downloading ebooks and other content from non-Apple sources harder and thus less competitive. * By forcing competitors to provide a way for Apple to get a major slice of the purchase price, Apple makes ebooks and other content from non-Apple sources more expensive and again less competitive. Obvious Implication: Apple does not intend to invest enough time and money in the iBookstore/iBooks to make the combination an appealing, feature-rich, multi-platform competitor to Amazon’s Kindle device and apps. You see that in the tech news. In the space of time Apple adds one new feature, Amazon adds roughly four. Amazon’s Kindle development team, apparently located not far from Apple’s headquarters, must be very hard working. My Comment: I’m a less than a rousing fan of the Kindle. I’m delighted by the ePaper screen, but I’m a serious reader, one who needs to extract quotes and take notes I can use easily elsewhere. I’m sticking with my aging Kindle 1 until there’s a model with a keyboard that isn’t awful (maybe even a Bluetooth keyboard functionality) and Mac applications that can make use of the notes I make. That web page isn’t enough. Amazon’s Kindle development team could also learn a lesson from the amazing creativity of iOS developers. Kindle owners need more than crossword puzzle games. The fact that ePaper screens are b&w and update slowly is countered by the fact that they can display forever without consuming power. With that in mind, they should check out Apple’s app store and create Kindle versions of highly popular apps that don’t need flashy color. Activity calendars and to-do lists are two obvious examples. Amazon also needs to realize that every reason it gives Kindle users to carry that Kindle about with them means more reading on-the-go and thus more ebooks sold. A synched grocery list that could be shared between husband and wife Kindles is an obvious example. Hubby, picking up what Wifey wanted, would follow up his purchasing by reading in line and even telling those in line about how great the Kindle is. The Kindle would get the sort of buzz usually reserved for Apple products.